In short, inverter pump replacement is old news. What’s new is that the dealer will perform the service for free, at least until November 30th, 2013, as announced yesterday (read a regurgitated press release from ConsumerReports.com) regardless of whether the pump is working or not. Officially a “Limited Service Campaign”, no doubt everyone will call it a recall and the press will spin about Toyota quality and hybrid doubts, etc.. IMO it’s a “recall” with less urgency and “limited” duration. Given sufficient free time, I will compose a blog about manufacturer response to common failures in the internet age, titled “Service Campaigns: Don’t Call It A Recall”. 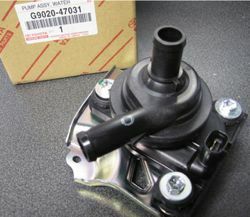 According to Toyota, the concern is air getting trapped in the impeller “causing pump actuation to be slow.” It is possible for air to get stuck at the pump if the system has been opened (coolant drained for collision work, or during maintenance, or in case of a leak, or when the pump is replaced for failure) but it’s no problem to bleed it. You just work the hose running from the top of the pump to the inverter reservoir until the pump is silent (with air the pump whines, which is abnormal). The noisiness of the pump with an air bubble makes it easy to tell when there’s a problem and, conversely, when the system is clear (i.e. no noise, no air). I’ve never seen air get stuck in the pump out of the blue. Serviced properly, there wouldn’t be any air to get stuck in the first place. In other words, it appears Toyota is replacing all these pumps because service techs can’t seem to bleed the system? On the other hand, I have replaced dozens of pumps because they’ve stopped working completely. The pump’s DC brushless motor can fail internally, causing permanent or intermittent failure. The pump can also seize if it’s run dry. Whatever the failure scenario, inverter temps will go up lacking coolant flow, eventually setting trouble code P0A93, Info code 346, illuminating the “check engine” light and the big red triangle (“Master Warning Light”). A couple times I’ve seen the pump short internally, which can cause some smoke and/or a blown AM2 fuse. The AM2 circuit feeds the Power Source Control ECU; without it the car will shut down and not restart. I find it much more likely that the campaign is meant to address the fact that the pumps are prone to failure, not air bubbles. Regardless of the stated reason, the effort is a win for Prius owners of the affected model years (2004, 2005, 2006, 2007). Unlike floor mats, the inverter water pump has a high probability of causing trouble and replacement should postpone a future emergency, perhaps forever (if the new pumps are sufficiently improved). To LG customers who have paid us to replace the pump in the past: we will email you another PDF copy of your related work order and credit card receipt (if applicable) to help expedite the process. LG will continue to stock the pumps (as we always have) for later model Prius (which still have failures). Toyota will not reimburse us for pump replacements on affected vehicles (LG is not a Toyota dealer) so anyone wanting us to perform the repair will have to pay the usual price of $308. Reference the original blog for price breakdown. A few words of caution: we’ve gotten numerous reports from our customers of dealer service departments upselling various things when an owner goes in for the accelerator pedal recall, effectively turning that problem into a money making opportunity. While anyone should take Toyota up on a free water pump, don’t buy anything else! Luscious Garage can perform those services better and for less money, if they’re needed at all.